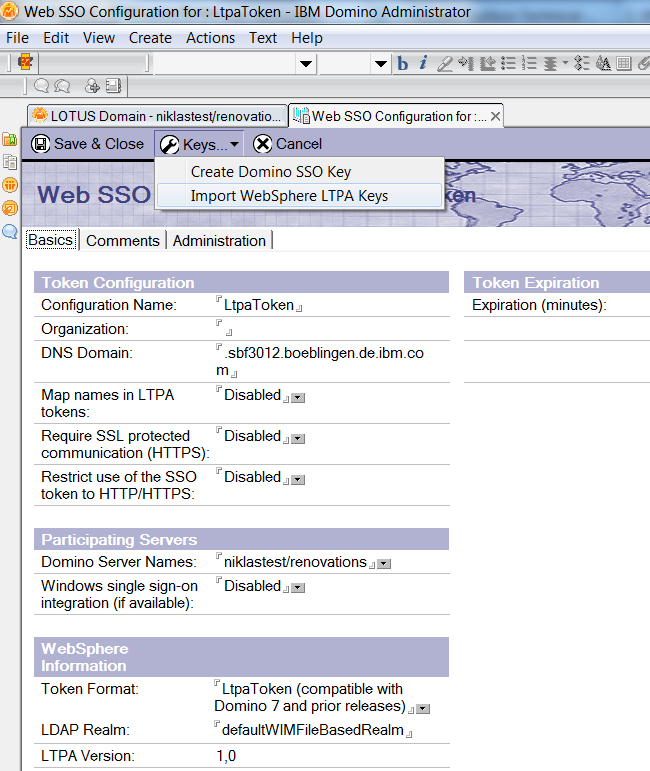 The other day I had to set up SSO via LTPA between IBM Connections and Domino. SSO between WebSphere and Domino has been possible for more than a decade and there are a couple of articles that describe this. The setup was pretty straight forward, but there were two things that I wanted to share since they took me some time. When I tried to import the LTPA keys I got an error “An R5 Web SSO Configuration already exists for this domain.” This technote describes the fix. After this the keys can be imported easily. The documentation that I’ve found often was written for older WebSphere and Domino versions with older screenshots. The important page to export the keys can be found under “Security-Gobal Security” and then by clicking the “LTPA” link on that page. This brings up the page to export the keys. This setup is necessary if you want to access the IBM Connections REST APIs programmatically from your XPages as blogged about on OpenNTF. I’d like to use this same mechanism in the social enabler so that the Abdera client wouldn’t be required.